Mickey's dream tumbles him into the night kitchen where three singing bakers mistake him for milk and put him in their cake batter. After explaining their mistake, Mickey flies to the Milky Way in a plane made of dough, and returns with the missing ingredient. Suggested level: ju... read full description below. The book is reproduced as the original with its comic-strip-like illustrations by Maurice Sendak and the rhythmical, chanting te reo Maori telling the story of Mickey's dream of falling into cake mix and flying in a plane of bread dough to find milk for the cake batter. 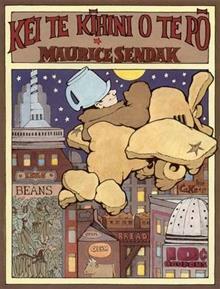 The author Maurice Sendak is the well-known author and illustrator of a host of children's books. Beginning as an artist, he illustrated more than eighty books authored by others, and he went on to produce more than fifty books of his own. He also produced animated stories for television and video and designed sets for opera and ballet. He won many awards for his work, including the Hans Christian Andersen award for children's book illustration and the Astrid Lindgren Memorial Award for children's literature. The translator Kawata Teepa (Tuhoe) has been a translator for fifteen years, carrying out translation work with the Ministry of Education, Te Kete Ipurangi, Te Taura Whiri i te Reo Maori, the New Zealand Translation Centre, and Pacific Translations, and working on translations of Windows XP and Vista and translation contracts.